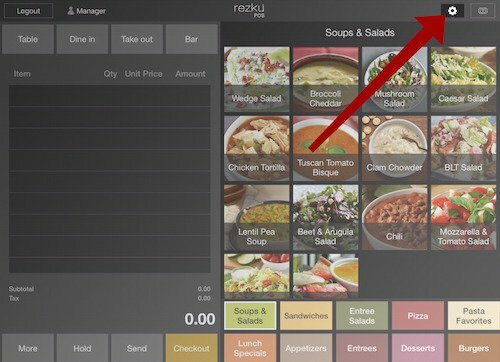 When taking orders in Rezku POS, servers can send tickets directly to chit printers in the kitchen, bar or other areas of the restaurant, with just a tap. Menu items on the same ticket can even be sent to different printers, so the bar gets the drink order and the kitchen gets the apps! Once configured on the Master Register, Slave Registers will automatically update with chit printer access. ● Plug in your printer’s power cable. ● Run a network cable from your chit printer to the router. Make sure your printer is set for dynamic IP by printing a self test. For instructions on how to run a self test and configure network settings, refer to your printer model the Printer Hardware documentation available from Guest Innovations. ● Log into Rezku POS Back Office. In the navigation column click Settings, then Printer Settings. In this example, we’ll add a printer for the Kitchen. ● To add a new printer click + Printer. The New Printer window opens. ● Name the printer and click Save. ● It will appear in the Printers list. 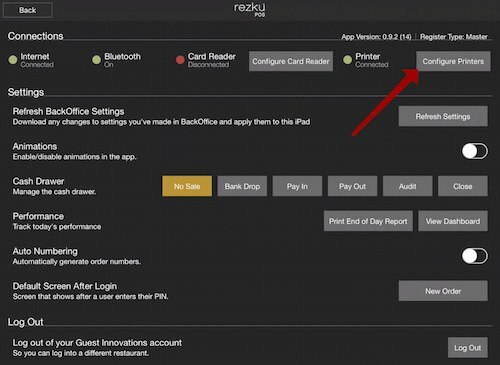 Once you have set up your Chit Printer in Rezku POS, the Printers List will display device information for the selected hardware. To delete a printer, click the X to the right, on the row with the printer name. To edit the printer, click the Pencil icon. You will receive a warning before deleting a printer. 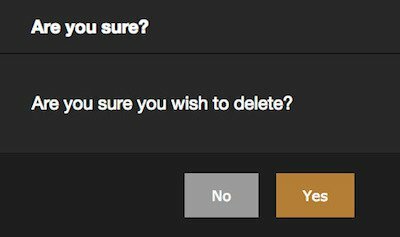 ● Click Yes to remove it. One way to choose which menu products are sent to this printer is with the check boxes in the New Printer window. 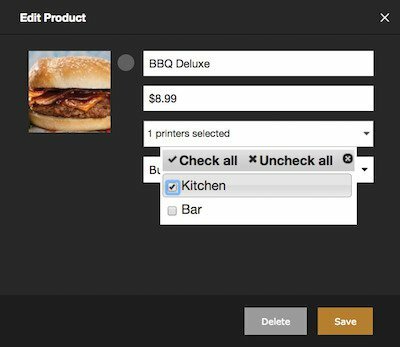 Click + next to the check box to expand the list of the products on a menu. ● Select items you want to sent this printer when printing orders. 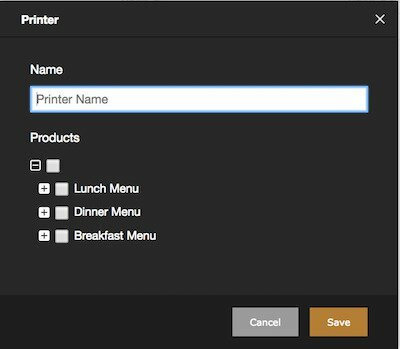 Another way to associate a product with a printer is in the Edit Product window. In Back Office Menu Designer, click on a product tile to open the Edit Product window. Select the printers you want the product sent to. For more detail on editing products, see the documentation available from Guest Innovations. Once the printer has been added to Back Office, configure it on the Master Register. 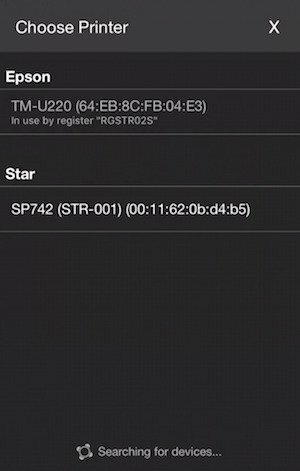 Open Rezku POS and enter Settings by tapping the Gear icon in the to top right. You’ll see the name of the printer you created in Back Office appear in the left column, under Cash Drawer Printer. 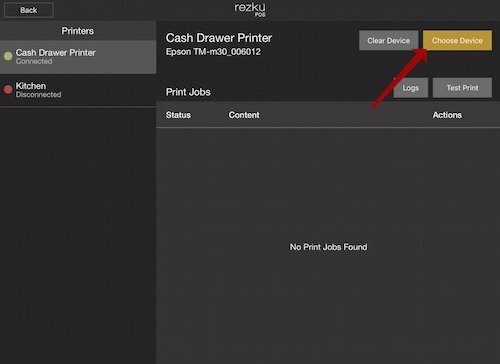 Notice that Rezku POS automatically tells you that the printer is disconnected and shows a red indicator. 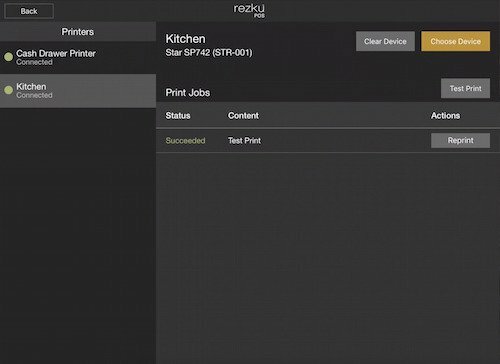 Rezku POS automatically searches your network for available printers. It even shows you if the printer in the list is already in use, and by which register. NOTE: Receipt printers can only be assigned to one register. However, chit printers can be used by any Slave Registers that are connected to the same Master Register. 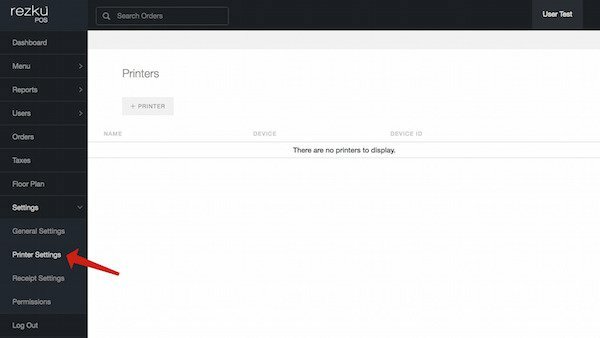 The printers you see available on the network will depend on the printer hardware you’ve installed and will differ from the example image somewhat. Tap the name of a printer to choose it. 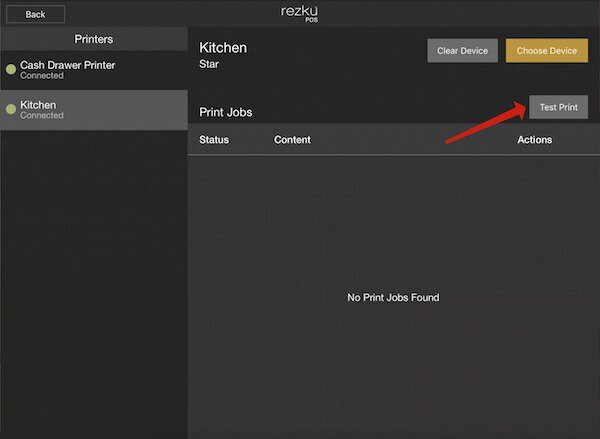 When Rezku POS connects to the printer, the indicator under the printer name turns green and changes from Disconnected to Connected, showing it’s ready to print. Your printer should output a small chit with test text on it. Also, you’ll see in the Print Jobs queue, a notification for a successful test print. If your test print was successful, then chit printing is properly configured and the steps are complete. If you encountered an issue, or the test print failed, examine your network settings and printer hardware. The friendly Rezku support team is always here to help if you have any questions!